Department of Aesthetic Plastic Surgery, Esthetic Service Clinic, Tbilisi 0171, Georgia. Rhinoplasty surgery remains one of the most difficult operations of the face. Improving aesthetic appearance and maintaining nasal function are inseparable goals in rhinoplasty surgery, and failure to achieve either of these objectives can be devastating for the patient. After evaluating a variety of rhinoplasty complications, increased attention was devoted to the surgical technique for reconstruction of the dorsal aesthetic lines and nasal tip projection in the patient with a prominent dorsal hump. Based on the modern concept of cartilage conservation, the autospreader flap rotation technique should be considered when dorsal reduction is required. Autospreader flaps are a useful tool in the prevention of postoperative nasal obstruction, segmental (inverted V) appearance, midfacial axial asymmetry and an overdone supratip break. In addition, they assist in preserving ethnicity of the nose when desired. The patient with a long nose, prominent dorsal hump, short nasal bones and low lower lateral cartilages are considered to be an ideal candidate for an autospreader flap. Therefore, every rhinoplasty surgeon should cultivate a full understanding of intranasal and external nasal anatomy, the differential diagnosis for nasal obstruction, and the elements of a complete nasal examination, including nasal endoscopy. In addition, a comprehensive analysis of the face and a broad understanding of the long-term effects of healing forces on the ultimate nasal aesthetic and function are required. Knowledge of rhinoplasty medical and surgical treatment options and side effects anatomical correlates can assist in anticipating them intraoperatively in certain surgical maneuvers. Patient safety is optimized with the use of specific surgical procedures, protocols, specialized instruments and staff training. Endotracheal monitored anesthesia care is preferable and a nasopharyngeal pack can be a useful preventative measure by helping to keep the larynx clear. The bony cartilaginous pyramid of the external nose is three-dimensional structure composed of three basic regions: the upper rigid bony third, the middle semi-rigid cartilaginous third and the lower mobile cartilaginous third. Nasal deformities result from the loss of support to this tripod [Figure 1]. The nasal dorsum connects the radix to the lateral projections of the crura of the lower lateral cartilages (LLCs) by means of two diverging concave lines. These are the nasal dorsal aesthetic lines, which are unbroken extensions of the superciliary ridges [Figure 2]. The radix and supratip regions have thicker soft tissue coverage, while the midvault area contains thinner tissue. The supratip break occurs cephalad to the nasal tip where the contour lines of the nasal dorsum rise toward the tip-defining points. The tip-defining points are composed of two equilateral triangles which extend from the supratip region to the apex of the domes to the columellar lobule angle. [8,11,12] To achieve a balanced dorsal profile with a supratip break, it is necessary to create a frame with a slightly deeper nasion and tip projection beyond the dorsum. 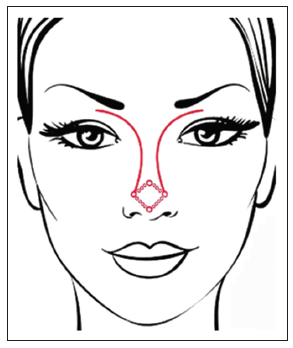 [10-13] From an aesthetic standpoint, the area from the nasal bridge to nasal tip should be aligned and straight. [14,15] Over reduction of the dorsum can change the orbito-nasal relationship with subsequent flattening of the midface. Clinical manifestations of complications of rhinoplasty and side effects may be classified as functional, aesthetic, or both. A number of technical solutions have been presented. [4,5,12,16] After a review of these potential complications, specific attention was directed to the surgical technique for reconstruction of nasal tip projection and the dorsal aesthetic lines in the patient with a prominent dorsal hump. Functional insufficiency of the internal nasal valve occurs in conjunction with the inverted V deformity (with disruption of the dorsal aesthetic lines) caused by collapse of the upper lateral cartilages following removal of the dorsal hump. This combined complication can be prevented during component reduction of the dorsal hump by avoiding excessive resection of the upper lateral cartilage as compared with the septum (midvault area) and by placement of spreader grafts. Another option involves the autospreader flap, in which the upper lateral cartilage and septum are preserved. Surgical time is reduced while maintaining the dorsal aesthetic lines and internal valve function. [16,18] Oneal and Berkowitz were among the first to utilize the upper lateral cartilages as spreader grafts, and they coined the term "spreader flap". [16,18-20] Gruber et al. subsequently referred to this maneuver as an "autospreader flap". If a hump is at least 3 mm above the ideal dorsal line, it is usually possible to fold the dissected ends of the upper lateral cartilages as local flaps at their interface with the septum. The upper lateral cartilage excess can be appreciated following precise reduction of the septum and bony hump. Autospreader flaps are bilaterally interposed between the septum and upper lateral cartilages, including the portion lying under the nasal bones. Where the hump is minimal and folding over the cartilages is not possible, it may be an option to simply return the upper lateral cartilages to the dorsum with suture fixation. With the use of asymmetric mattress sutures, the autospreader flaps are positioned horizontally, abutting the septum instead of being vertically folded and fixed to the septum. [10,16] Preservation of the dynamic musculoaponeurotic system with its ligamentous connections permits their repair at the time of closure. Repair of Pitanguy’s midline ligament using advancement suture allows the surgeon to control tip rotation, enhance projection, and emphasize a supratip break, while reconstruction of the scroll area ligaments provides stability of the internal nasal valve. [7,10,11] Utilization of the cartilage from the reduced dorsal septum permits successful reshaping of the middle vault and nasal tip. The resected cartilage fragment may also be used as a columellar strut, which thereby allows us to again forego the standard septal harvest, reducing operative time and patient morbidity. The ideal patient for this technique requires 3 mm or more of dorsal hump reduction, and should not have any breathing problems or septal deviation that would require septal surgery. It is important to identify the patient with a tension tip, as he or she will certainly require maintenance or restoration of tip projection to prevent a polly beak deformity. The cartilage-conserving concept can be efficient and aesthetic in well-selected patients, but as always anatomical differences will dictate the surgical approach. [22,23] Upon follow-up, patients demonstrate better postoperative recovery, with much less septal swelling and proportional projection of the dorsal aesthetic lines without over-widening at the K-area. The most common problem encountered is the technique’s inability to provide adequate dorsal width when compared to spreader grafts. In addition, the use of an autospreader flap has not been described for special cases such as the crooked nose, small dorsal humps, and in secondary cases. Therefore, relative contraindications to use this technique include those with a deviated dorsal septum, asymmetric dorsal aesthetic lines, and upper lateral cartilages of insufficient length at caudal end of the septum. This population likely benefit from traditional spreader grafts harvested from the nasal septum, perhaps combined with autospreader flaps. The thickness of free septal grafts can be varied to control asymmetry. 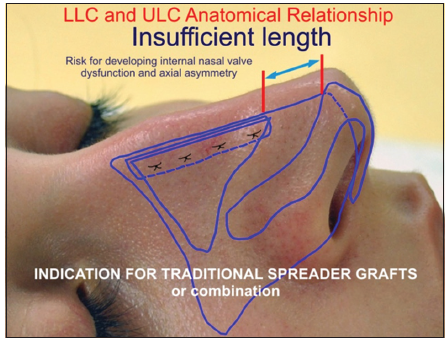 In the appropriate patient with nasal axial deviation who also requires a septoplasty, the combined use of autospreader flaps and unilateral or bilateral spreader grafts may be indicated to correct asymmetric dorsal aesthetic lines. Indications for the use of both techniques include widening of the dorsal middle third of the nose (especially in ethnic cases), bridging and strengthening a long, narrow roof of the middle nose in patients with short nasal bones and high LLCs, straightening and stabilizing a dorsally deviated septum, and creating ethnically acceptable dorsal aesthetic lines [Figure 3]. Nasal septal grafts are thicker and stronger, resisting the deforming forces of a deviated septum and thus correcting the curvature. Autospreader flaps alone may not provide adequate stability when there is associated collapse of the bony sidewalls. 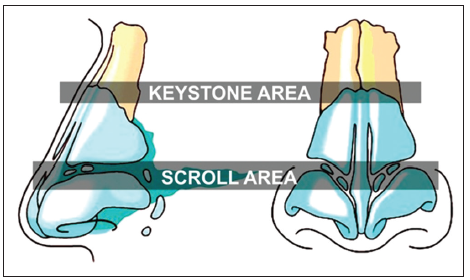 In these instances, traditional spreader grafts that extend beyond the keystone are indicated. For cases in which an autospreader flaps cannot provide sufficient width at the anterior septal angle, this area must be supported by spreader grafts [Figure 4]. The patient with a long nose, prominent dorsal hump, short nasal bones and low LLCs are good candidates for an autospreader technique [Figure 5]. The technique is simple, reproducible and effective in shaping the dorsum while preserving the function of the internal valve in primary rhinoplasty patients. Subperichondrial dissection of the nasal framework with preservation of the dynamic musculoaponeurotic system and controlled manipulation and repair of ligaments without disturbing the overlying soft tissue allows reshaping and redraping of the nasal aesthetic lines. The relation between anatomical form and function is of enduring interest in modern aesthetic plastic surgery, being central to our understanding of physiological systems. It provides lessons for engineering design based on advanced anatomical knowledge. For now, limited evidence available in PubMed that shows benefit of using spreader flap technique for correction of dorsal septal deviations. The use of a spreader flap technique has not been described for special cases with minimal dorsal humps and secondary cases. The spreader architecture rhinoplasty requires wider studies in compare and contrast flap and graft techniques to identify which technology provides the most benefit in terms of outcomes for more durable, consistent, predictable and harmonic results. 1. Nahai F. Your favorite technique: time for a change? Aesthetic Surg J 2012;32:900-2. 2. Nahai F. Evidence-based medicine in aesthetic surgery. Aesthetic Surg J 2011;31:135-6. 3. Gunter JP, Hackney FL. Clinical assessment and facial analysis. In: Gunter JP, Rohrich RJ, Adams WP Jr, editors. Dallas Rhinoplasty: Nasal Surgery by the Masters. St. Louis: Quality Medical Publishing; 2002. pp. 53-71. 4. Sajjadian A, Guyuron B. Primary rhinoplasty. Aesthetic Surg J 2010;30:527-39. 5. Becker DG, Ransom E, Guy C, Bloom J. Surgical treatment of nasal obstruction in rhinoplasty. Aesthetic Surg J 2010;30:347-78. 6. Guyuron B. Soft tissue functional anatomy of the nose. Aesthetic Surg J 2006;26:733-5. 7. Palhazi P, Daniel RK, Kosins AM. The osseocartilaginous vault of the nose: anatomy and surgical observations. Aesthetic Surg J 2015;35:242-51. 8. Rohrich RJ, Muzaffar AR, Janis JE. Component dorsal hump reduction: the importance of maintaining dorsal aesthetic lines in rhinoplasty. Plast Reconstr Surg 2004;114:1298-308. 9. Wang ZJ, Wang N, Yang HM, Bai SL. Investigation of the layers and vascular density of the soft tissue in the inferior nasal portion. Zhonghua Zheng Xing Wai Ke Za Zhi 2007;23:65-8. 10. Cakir B, Oreroglu AR, Dogan T, Akan M. A complete subperichondrial dissection technique for rhinoplasty with management of the nasal ligaments. Aesthetic Surg J 2012;32:564-74. 11. Kim SK, Kim JC, Lee KC, Kim HS. Correction of the supratip deformity of the nose. Aesthetic Surg J 2012;32:943-55. 12. Guyuron B, DeLuca L, Lash R. Supratip deformity: a closer look. Plast Reconstr Surg 2000;105:1140-51. 13. Ponsky D, Eshraghi Y, Guyuron B. The frequency of surgical maneuvers during open rhinoplasty. Plast Reconstr Surg 2010;126:240-4. 14. Gruber RP, Weintraub J, Pomerantz J. Suture techniques for the nasal tip. Aesthetic Surg J 2008;28:92-100. 15. Daniel RK. Tip refinement grafts: the designer tip. Aesthetic Surg J 2009;29:528-37. 16. Gruber RP, Melkun ET, Woodward JF, Perkins SW. Dorsal reduction and spreader flaps. Aesthetic Surg J 2011;31:456-64. 17. Sheen JH. Spreader graft: a method of reconstructing the roof of the middle nasal vault following rhinoplasty. Plast Reconstr Surg 1984;73:230-9. 18. Byrd HS, Meade RA, Gonyon DL, Jr. Using the autospreader flap in primary rhinoplasty. Plast Reconstr Surg 2007;119:1897-902. 19. Manavbasi YI, Basaran I. The role of upper lateral cartilage in dorsal reconstruction after hump excision: section1. 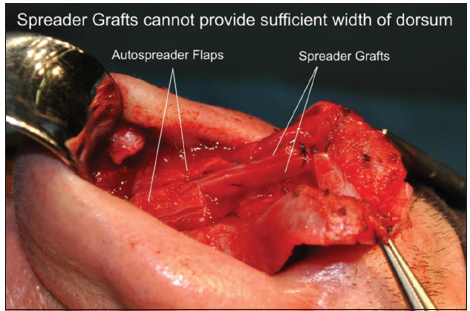 Spreader flap modification with asymmetric mattress suture and extension of the spreading effect by cartilage graft. Aesthetic Plast Surg 2011;35:487-93. 20. Oneal RM, Berkowitz RL. 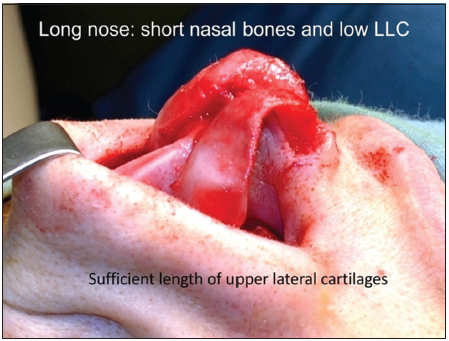 Upper lateral cartilage spreader flaps in rhinoplasty. Aesthetic Surg J 1998;18:370-1. 21. Rohrich RJ, Liu JH. The dorsal columellar strut: innovative use of dorsal hump removal for a columellar strut. Aesthetic Surg J 2010;30:30-5. 22. Aston SJ. A plastic surgeon's evolution. IPRAS J 2011;(6):33-4. 23. Spiro SA, Wolfe SA, Wider TM. The use of the labiocolumellar crease incision in rhinoplasty. Ann Plast Surg 1996;37:569-76. 24. Yagmur C, Kelahmetoglu O, Akbas H. Spreader flap correction of dorsal septal deviations. Aesthetic Surg J 2015;35:345-8.